Learn how SkillSurvey can bring additional value to your hiring and onboarding practices with a new solution that bridges the gap between human resources and credentialing teams to change the way your facility onboards privileged care providers. SkillSurvey has partnered with over 800 hospitals to better hiring practices by transforming the way you reference check candidates. Our online reference checking solution has helped talent acquisition and recruiting teams in the healthcare industry improve reference response rate, quality of hire, and ultimately their ability to onboard top talent for the medical community. Today, one of the most important yet difficult roles to fill in healthcare is that of clinicians, specifically physicians and allied health professionals. In many ways, medical facilities are defined by their privileged care providers, so it is crucial that you are onboarding top notch professionals and credentialing them thoroughly, but also providing a smooth applicant experience from the time of recruitment through privilege approval. 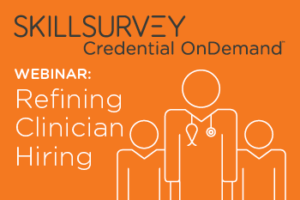 SkillSurvey has introduced a new solution, SkillSurvey Credential OnDemand, that in conjunction with SkillSurvey Reference, will help to refine clinician hiring and speed time to credential so your facility can more effectively secure top talent and ensure patient safety while saving time and money.